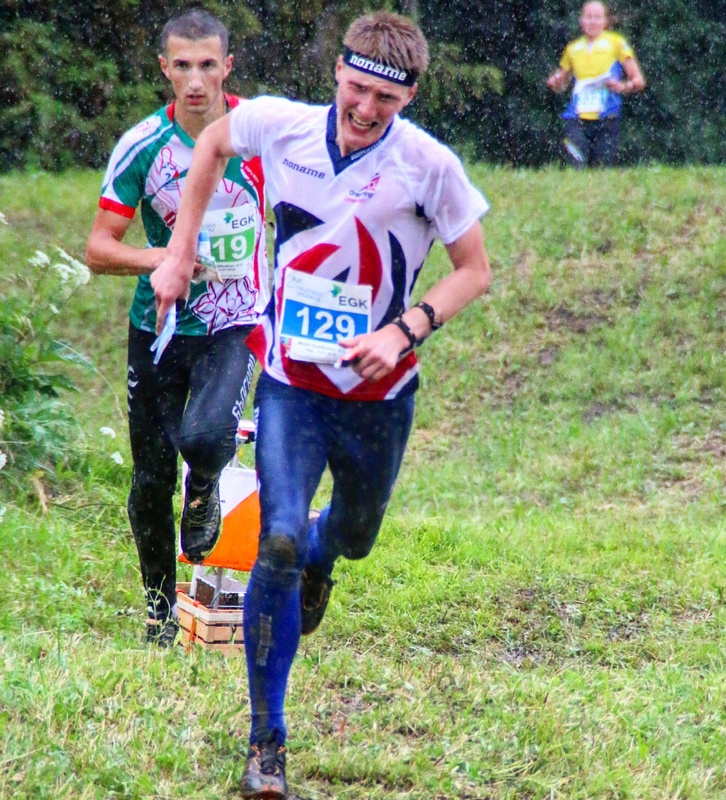 The Junior World Orienteering Championships (JWOC) has always represented the major goal in my Junior Orienteering Program. 2016 was my final year in the Junior ranks and whilst I have raced for Great Britain at several European Youth Championships and twice at the Junior European Cup, I was determined to go out on a high at JWOC in Switzerland. Throughout the Winter of 2015 and spring of 2016 I put an extra focus on my training, nutrition and performance lifestyle. I’m currently studying at Sheffield University and the great training group and tailor made strength and conditioning program made this a lot easier. Unfortunately, I was hampered by a knee injury for much of the season limiting the volume of training I was able to do. Thankfully I was able to reach a good fitness level in the weeks leading up to our Great Britain team selection races. After some solid performances I waited anxiously for news on the selections. I was delighted when I found out I’d been selected alongside 11 others (6 boys and 6 girls in total) for JWOC. Winning the British Middle Distance Championships in M20 Elite Just three weeks before JWOC was a final confidence booster and confirmed I was in good form. The team met at Manchester Airport on the 6th of July to begin our trip to Switzerland. We flew to Bergamo airport in Italy. On arrival we stopped for food and to do a large shop – seemingly buying every banana in the supermarket. We then drove across the border and through the beautiful Engadin Valley to reach our accommodation and the event centre in the village of Scuol. We were staying in a Youth Hostel alongside many others teams. We spent the next few days training and getting accustomed to how it felt running at altitude; especially important for those of us running the long distance race held at between 2200m and 2000m above sea level. Each member of the team was running two out of the three individual races (Sprint, Middle or Long) as well as the relay race. The first race of the week was the Sprint – this was the race that I wasn’t doing. Frustrating as it was to sit this one out it was great fun supporting the rest of the team who were racing. 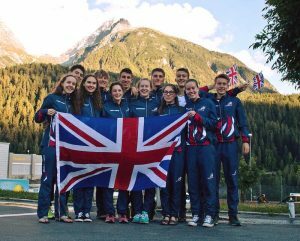 A particular mention must go to Megan Carter-Davies who had a great race to finish in 7th place, equaling Great Britain’s best ever female sprint result at JWOC. Dane Blomquist though disappointed with his race, deserves a mention as the best British male finisher in 41st. That evening we debriefed as a team and congratulated our sprinters, before discussing the Long Race. The long race was fairly remote and we would have to take public transport; a train and bus to reach the pre-start area. I woke early on Monday in order to catch my train – I often struggle to eat before big races but the vast array of Swiss Muesli, yoghurts, cheeses, meats and breads available at the Youth Hostel made things easier! I was glad to share my train and bus journey with Jenny Rickets a fellow British Team member; we chatted about our University’s – Edinburgh and Sheffield and the great rivalry between them. This served to take my mind off the race keeping me relaxed. Almost as soon as my race started I realized it was going to be a long tough day. The terrain was rough and steep with many rocks and lots of vegetation. I managed to keep my navigation clean and battled around the course. Upon finishing I was drained – the heat and altitude had taken its toll on my body. I was disappointed with my performance but knew this wasn’t the time for moping. The sooner I could take on board fluids and food the better my recovery would be; this had to be the priority if I wanted to give myself at chance of performing in the middle distance race to come on Wednesday. Tuesday was a rest day and all the team took the opportunity to have a long lie in before cramming in as much food as possible. After breakfast we had a team meeting. We had all found the long race really tough – our best result came from Will Rigg who placed 31st. It was now important to put this behind us and focus on our next goal the middle distance race. We also met up with the Swedish team at their hotel and played various games such as ping pong and table football! The middle distance race consisted of a qualification race on Wednesday and a final on Thursday. I was really excited for this race – and had high hopes of making the final. The Qualification races divide the competitors into three heats A, B and C. The top 20 runners in each heat progress to the Final. I ran hard but more importantly avoided mistakes in the first technical loop of my course and was in 6th place before a long leg to number 8. Unfortunately, I missed my control by about 10 meters and it took me around 1:45 to relocate. I battled hard hereafter, nailing the rest of my course as heavy rain began to fall on the steep rocky slopes. When I finished I faced the agonizing wait to see if I would make the top twenty. In the end I was gutted to miss out on a top 20 position by just 1 minute – frustratingly my time behind the leader would also have been good enough for qualification in heat B. I found this hard to take as my race was so much fun and I’d nailed 90 percent of the course but just one mistake had cost me. However, that’s the way orienteering is and why we keep coming back, searching for that illusive perfect race! On Thursday those of us who didn’t make the final travelled to the arena to spectate. We had a great chance of some top results with Fiona Bunn finishing 2nd in her heat with Megan 3rd in hers. We also had three guys, Dane, Daniel and Sasha in the men’s Final. First through the arena was the Dane after whom the rest of the team gradually filtered through. We cheered everyone through and it was awesome watching Megan take 4th place in the middle distance. Sasha also produced a solid race to finish in 16th on the highly competitive and hard fought men’s’ course. Friday was the Final day of racing, the relay. All of our four teams were strong and capable of a top result. On first leg for me was Will Rigg, he made some mistakes early on then ran well to bring us in in 24th position. I ran a strong clean race to bring us up to 21st place with Harrison on last leg again running well to bring us up to 16th. The relay was arguably my best performance of the week and a real positive to end on. The other men’s team were 9th place (12th including 2nd teams). The women’s first team were a fabulous 5th and the 2nd team were 16th. Finishing with 4 teams inside the top 20 was great way to finish the week. Whilst I wasn’t satisfied with my individual performances JWOC has only fueled my hunger and desire to make it to the top. The team had a lot of fun and meeting Junior orienteers from across the world was a real highlight. I can take away many positives from my races at JWOC, particularly the majority of my middle distance race in which I kept pace with the very best Juniors in the World. Transitioning into the senior ranks next year will be a huge challenge but one that I approach with a lot of great memories and valuable experience gained at the Junior Level. I’d like to thank; Airienteers, The John Taylor Foundation, Yorkshire and Humberside Orienteering Association and the Leeds Sports Federation whose generous donations made this trip possible.